In “The Wilderness Years” television documentary (1981), actor Robert Hardy faithfully captures Martin Gilbert’s image of Churchill in the Thirties: politically frustrated, less than effective as a father and a husband, worried over ominous developments in Germany—yet also enjoying his most productive decade as a writer and historian. Churchill has been touring the Danubian battlefields of the First Duke of Marlborough, whose biography he is writing. He is accompanied by his wife Clementine (Sian Phillips), their son Randolph (Nigel Havers), their daughter Sarah (Chloe Salaman), and his close friend Frederick Lindemann, “The Prof” (played by David Swift). With them are Brigadier Packenham-Walsh, who is drafting maps for Marlborough, and his wife (whom Churchill calls “Mrs. P-W”). At the hotel they are met by Randolph’s acquaintance and Hitler’s foreign press secretary, Harvard-educated Ernst “Putzi” Hanfstaengl (played very accurately by Roger Bizley). Putzi hopes to introduce Churchill to his boss. Writer-director Ferdinand Fairfax takes necessary liberties to shorten and dramatize what actually happened. Hitler (a very grim-looking Gunter Meisner) is shown in evening dress, apparently ready to sit down with the Churchills. But first, he watches furtively from a distance, and then balefully gazes through the restaurant window, catching the eye of the ever-curious Prof, who signals Hanfstaengl. Putzi tries to fetch Hitler to the table, but is furiously turned away. Fairfax neatly gets around all this with the brief, dramatic scene we see here. True to fact, Churchill makes his famous declaration about the dangers of anti-Semitism, not to Hitler, but to his press secretary. Putzi Hanfstaengl is considered a reliable witness. Suave and westernized, he tried to exert a moderating influence over the Nazi leader, but fell out of favor in 1936. Suspecting he was marked for assassination by Goebbels, he hastily left Germany in 1937 and wound up in the United States, where he advised President Roosevelt on the Nazi regime. 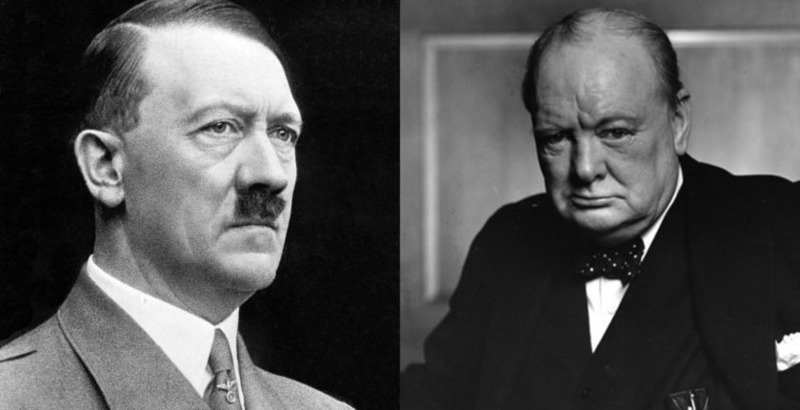 The anecdote is based on his 1957 book, Hitler: The Missing Years, and corroborates Churchill’s version in his first volume of war memoirs, The Gathering Storm. This episode begins with a poignant scene between Winston and Clementine which neatly defines their marriage—one of deep mutual devotion, but needing periods of separation from time to time, lest the high-strung Clemmie collapse from the pressure. Winston longs for a closer relationship; Clementine says he should have married Goonie (Lady Gwendolyne Bertie, his sister-in-law). She wishes he would be content with things as they are.